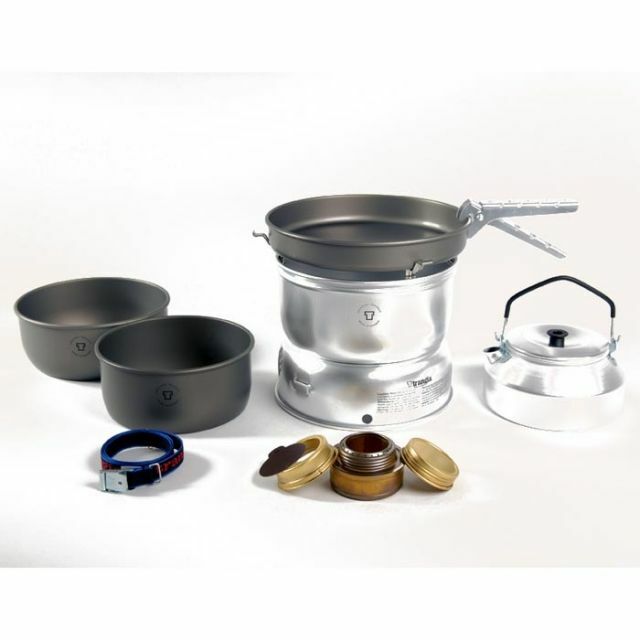 The Modified Starlyte alcohol stove from Zelph’s Stoves is a great stove mainly for water boil that is ultralight, very fuel efficient, and safe to use. It holds fuel inside of it and won't spill, and it comes with a plastic lid to seal it off and minimize fuel evaporation when not in use. 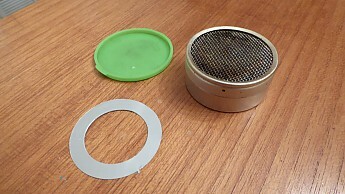 This is a review of the Zelph’s Stoves Modified Starlyte alcohol stove. Zelph is a true “cottage” manufacturer, just one guy (Dan) who tinkers in his hobby shop to come up with mostly alcohol stoves and sometimes re-worked cooking pots. Oddly, Zelph’s website is woodgaz-stove.com (even though none of his current offerings are wood-burning stoves). I am not affiliated with Zelph in any way. 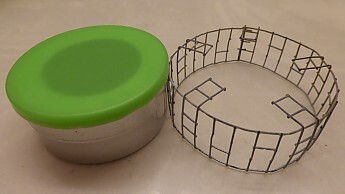 Otherwise it is identical to the original Starlyte (BTW Dan has re-worked the original Starlyte so that it no longer has the built-in pot stand and also now comes with a lid). 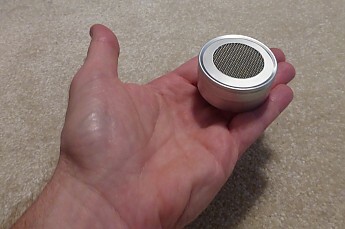 The Modified Starlyte is less than an inch high, 2.125” in diameter and weighs 0.59oz on my scale with lid. The Modified Starlyte is a great stove for water boil for 1-2 people. 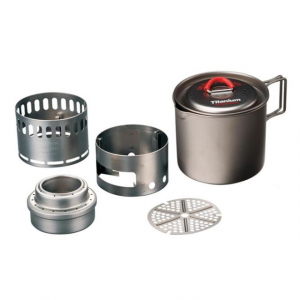 It can be used for cooking as well but does not have the adjustability of a valve-operated canister stove. The Modified Starlyte is non-pressurized and requires a pot stand (you cannot sit your pot directly on top of the stove). 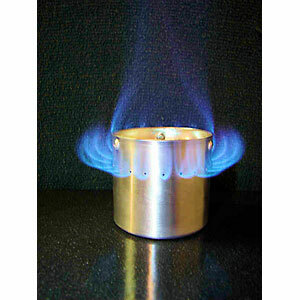 Compared to other alcohol stoves, the Modified Starlyte stands out in several ways. 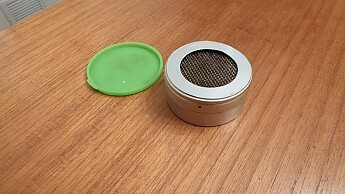 The stove has a porous material on the inside of it (I believe it is carbon felt but I’m not actually sure) and a small plastic lid. The porous material inside the stove does not burn up, and it will “hold” the alcohol fuel in suspension, which has a few distinct benefits. EDIT: just read a post from Dan, make of this stove, on another forum that he does NOT use carbon felt as a wicking material in the Starlyte. First, it means that the stove can’t spill if tipped over (unless it’s overfilled), and spilling is one very dangerous downside to alcohol stoves in general that this stove overcomes. Second, it means that you don’t have to worry about exact fuel measurements because whatever fuel you put into the stove that is not used on a given burn will be held there until next time to be used. So, no wasted fuel, and no need to fiddle with trying to recover unused fuel. Third, the lid seals the top when not in use so that any fuel left inside the stove won’t evaporate away. In fact, for a short overnight trip you could put fuel in the stove before you leave and not even need to bring a fuel bottle. The simmer ring that distinguishes the Modified Starlyte from the regular Starlyte cuts down on the surface area of the stove’s burn area, effectively choking the flame down to a smaller diameter. This makes the already fuel-efficient Starlyte stove into an even more fuel-efficient stove (with the tradeoff of longer boil time). And, with the lid preventing evaporation, you are guaranteed to be able to use every drop of fuel you put into it. I must admit that when my Modified Starlyte arrived when I bought it in 2014, the first thing I did was to pull the simmer ring out of the stove’s housing. I don’t recommend you do this, honestly I’m not sure how I did it without destroying the ring or the stove but somehow I did. This gives me the flexibility to use the stove as a “regular” Starlyte without the simmer ring or to place the simmer ring on top of the stove to still use it to trim in the flame’s diameter for ever greater fuel efficiency (if you want that flexibility I suggest you ask Dan to not install the simmer ring inside the stove housing and to send it loose in the box). Still, without the simmer ring, in my Caldera Cone setup my Starlyte stove will bring two cups of water to a boil on only a half fluid ounce (15ml or about 12g) of fuel in about seven minutes (this is without using the simmer ring—with the simmer ring the boil will be about 10 minutes and will use even less fuel). So clearly the Modified Starlyte is extremely fuel efficient—by needing very little fuel to achieve a boil, by preserving unused fuel in the stove, and by prevents the fuel from spilling or evaporating. It also saves weight by not needing a stove snuff to extinguish the stove, you can extinguish it with a single quick puff from your mouth, a little strong than blowing out a candle. 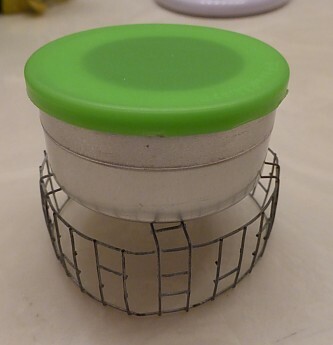 The Modified Starlyte is recommended in particular for Caldera Cone type setups, which traps the heat from the stove very well and also serves as the pot stand. 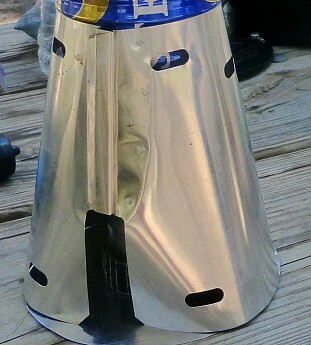 In fact, it was the cone that inspired Dan to develop the “Modified” version of the Starlyte in the first place to keep the temps from getting too hot inside the cone. However, I have found that the Starlyte without using the simmer ring does not get too hot for my setup (the Fosters beer can pot “Keg-F” Caldera Cone) and gets me to that boil a little more quickly. 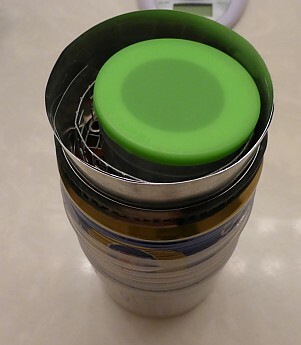 The stove fits inside the Fosters beer can when I pack up my cook kit to keep everything organized and protected. Another great feature of this stove is that it cools very quickly once extinguished—depending on outside temps, within just a couple of minutes after extinguishing it I can pick up the Starlyte with my bare fingers and put the plastic lid on without it melting or deforming. Keep in mind that the reason it cools so quickly is that it is made of very thin aluminum (think of the little metal holders that tea light candles come in). Since the metal is so thin there is the potential to crush this stove if you stepped on it, but it is plenty sturdy for normal handling. I’ve used this stove on all trips for over three years and it has performed flawlessly. The stove is well made and has had no performance issues in my usage. It’s great for 1-2 people—I have the 750ml Fosters pot for solo and a larger “Conquistador” beer can pot (945ml) that I can bring for two people to boil about 3.5 cups. 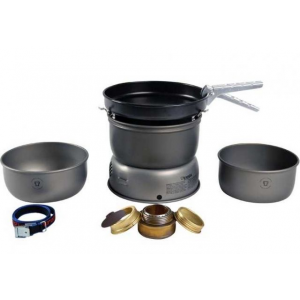 You can cook real food with this stove, however as with other alcohol stoves you do not have the ability to fine-tune the heat like with a valve-operated canister stove. At least by having the simmer ring separate from the stove you can have two “settings” with this stove for some flexibility. If you need to melt snow for drinking water on a winter trip then this stove is not your best choice, simply because its fuel capacity isn’t large enough to burn long enough to melt as much snow as you’ll probably need to. 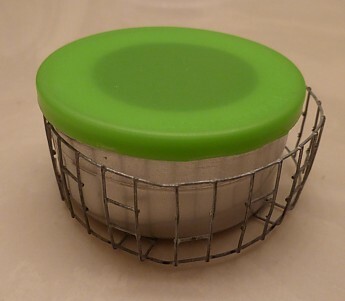 Zelph does sell two larger versions of the Starlyte, one that is a little taller and holds 3 fl oz of fuel in suspension, which is a great choice for melting snow, and also one that has a larger diameter that can be used for a larger pot when cooking for multiple people. The stove stand adds only 0.14 oz (about 4g), which I figure I can more than save in fuel weight for the extra efficiency it provides. Great timing JR and excellent review. I was on the fence about switching alcohol stoves again but this put me over...was already looking at this after going from the 12 10 stove to the sturdy Vargo Triad but now I want something that sits the difference. Phil, what is the rest of your setup? One thing I found is that the Keg-F Caldera cone is designed so that the pot bottom will be at the optimal height above the top of the 12-10 stove, which is taller than the Starlyte by about 3/4". That's why I made the stove stand I referenced above in my review, so that the top of the Starlyte will be at about the same height as the 12-10 would be. I'm adding a couple of pics to my review to show that clearly. JR. Thanks for the additional info. I'm not too worried about the height as I use the CC Sidewinder Ti Tri. 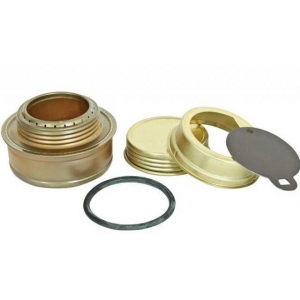 I have found in playing around with different alcohol stove options that the 3-tiered pot settings (wood, alcohol, and esbit) of the Ti-Tri cover the range for most alcohol stoves. I just measure the difference between the 12-10 and any other stove and figure out if I need to raise or lower the pot in the stand. If it sits in between the settings I can wait to see how efficient it is, then add a stand if needed. One other question...have you used a full ounce of alcohol and if so how long does it burn? I sometimes boil and then adjust the stove higher (to wood burning height) to continue simmering a meal even on alcohol stoves. Do you think an ounce of fuel would burn for 20 minutes? 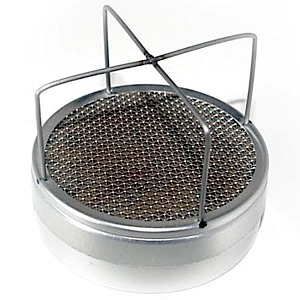 Combine the height adjustment with the simmer ring and it could achieve several cooking settings! Wasn't planning on it. It will hold an ounce but no more. I use it with a half ounce of denatured alcohol and get a good boil with a little left to spare. Great review, JR! Thanks for sharing all of the details and pictures. Ok. I can put together some photos and a quick write up. Phil, I do think an ounce would burn for 20 minutes -- the half-ounce it takes me to boil 2 cups in 7 minutes, if I just let it continue to burn, will last about 10. That's without the simmer ring, which would add maybe 3 more minutes per half ounce. Yes I have put a full ounce in, but I have not let it all burn but rather just left the remainder inside for the next meal. Before lighting I usually top it off with a splash of fresh fuel just so that there is some right near the top grill to make it easier to ignite. The Zelph's Stoveworks Modified Starlyte is not available from the stores we monitor.